Meg Maher Pierce grew up in the Buffalo area. A graduate of the College of New Rochelle, she went on to gain a Masters in Art and Art Education from Columbia University, NY, NY and a MFA in Painting from Pratt Institute, Brooklyn. She was a teacher of art the Herricks Schools, New Hyde Park, on Long Island from 1969-2001 and found teaching to be an extraordinary source of energy and pride. 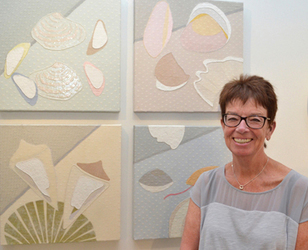 She lost her beloved husband Vernon Pierce in 2008, and she now devotes herself totally to her art practice in Sarasota, Florida. Her latest work has been with hand stitching, mixed media, collage and painting featuring vintage fiber, silk flowers, leaves and found objects. She has shown widely in the NY area, as well as recently at Florida CraftArt St Petersburg, FL, Selby Gallery, Ringling College of Art & Design, Sarasota, FL, Harmony Gallery, Sarasota, FL and Art Center Sarasota, FL. Other studies in art include the Vermont Studio Center, Johnson, VT, Sun Valley Center for the Arts in Idaho and Oxbow, Saugatuck, Michigan, as well as study abroad in Italy and China and India. Her latest work has been mixed media collage, hand stitching, and painting in acrylics featuring fiber and found objects. Meg now lives and works in Sarasota, Florida.